We are San Angelo's original live music venue and a must-see stop on the popular Texas Country and Americana Music circuit. Our cozy stage gets you up close and personal with many of the popular and rising music stars. Located in historic downtown San Angelo, we welcome you to stop on by for an experience that is authentic Texas. 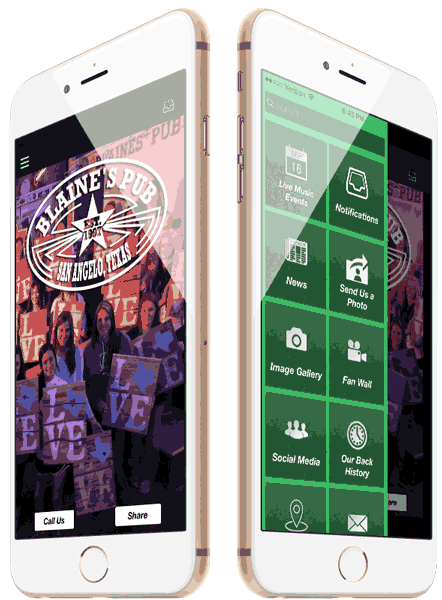 Get the Blaine's Mobile App! Stay up-to-date with what's happening at The Bar of Your Dreams®. Get notified when the next big show is coming. You can also view our awesome live music line-up. Occassionally, we'll update you on when you can get the best parking. It's available for iPhone and Android. Subscribe to our Spotify playlist and keep up with who's playing at Blaine's on your smartphone. It's constantly updated with the latest Texas Country Music of bands and artists who are coming along with the best one's who have been here. It's free! All you need to do is get Spotify!